Indeed when you recognize certain motifs the good moves almost automatically pop up in our minds. See for instance the first diagram. Can you see how white can obtain a winning advantage? Please think for a while before you read on. Was it hard to find the correct solution? If you haven’t found the solution yet, you will find it almost within the blink of an eye when I tell you what motif to look for. Think: bank rank mate. Now it becomes a lot more easy. In his book Gormally gives 160 mating finishes. This one doesn’t necessarily end in mate, but the threat is there. Best case scenario: it ends material loss. See for yourself: 1. Qxf8 Qxf8 (if 1. – Kxf6 2. 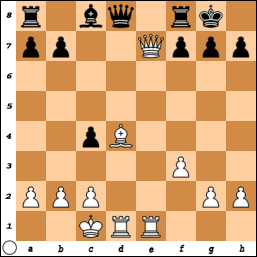 Bc5+ and mate) 2. Bc5! And black loses the exchange because he has to give his queen (see all variations). The next example is more complicated. Do you see the motifs? I got the motifs right, but still missed some crucial variations. See the solution. Danny’s book is very instructive. The examples are not always easy, but you will learn a lot. All these attacks are a lot of fun to study. Besides that Danny’s writing is very witty and a pleasure to read! 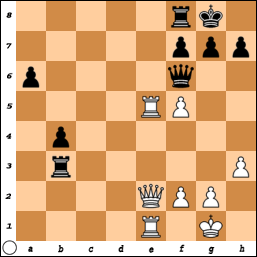 ← Chess puzzle #46: how to break black’s defenses?